I don’t know if Mercedes just had an exceptionally talented photographer here (it did) or if I’m just high off yellow paint (a little), but I’ll be damned if the 2020 Mercedes-AMG CLA35 isn’t one of the finest looking new cars right now. The sculpted front is expressive and lively without being annoyingly aggressive, the tail and rear lights look like a callback to something bigger and more luxurious, and the swooping roof reminds me of what I liked about the CLS when that first came out years ago. I’m not crazy about the rear bumper sculpting near where the reflectors are at, and I’m sure about the crease down the gunwales, but generally speaking it’s impossible to get an unflattering angle on this thing. 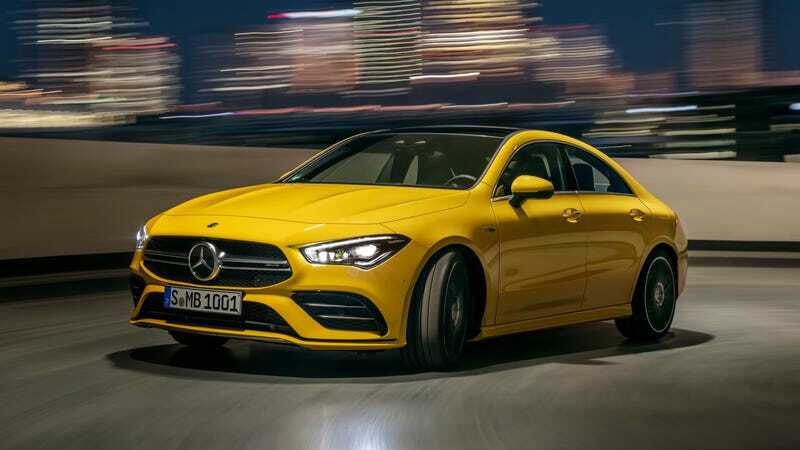 Like the A35 that was shown off last month, the CLA35 has a 2.0-liter turbocharged four-cylinder engine making a claimed 302 horsepower and 295 lb-ft of torque. The transmission is a seven-speed automatic, all-wheel drive is mandatory, and propulsion is going to be heavily managed by Mercedes’ traction control computers and driving aids. Also like the A35, this car gets 13.8-inch brake discs up front with four-piston calipers. According to a preliminary spec sheet, it’s 0.1 seconds faster from 0 to 60 mph than its A-Class brethren, but otherwise the two cars seem pretty closely related. As such I’m not entirely sure why both cars exist, but I have to admit I’m smitten with the design of this one and I’m looking forward to seeing them on the road. Good thing, I guess, because entry-level AMG cars are pretty common in LA’s “Beverly Hills-adjacent” neighborhoods. Mercedes didn’t list a price or top speed in its launch release, but today you can order a 375-HP 2019 CLA45 for about $53,000. The CLA35 will have to slot under that to leave room for a 2020 CLA45 revised in this body style, so I would guess this will ring up in the mid to high-$40,000s range. Hot damn. New Mercs really do look good in yellow.